Rectangular cases with birch veneers, four drawers with solid birch and polished aluminum metal pulls, manufacturer's brand inside top drawers. Very good original condition, with a rich and mellow finish typical of 6o year old birch veneers. Bearing Serial #170, this case shows two repairs, the more evident on the right rear upper "micro-cantilever" lip detail and showing in the photographs. Drawer pull lacquer refreshed, metal polished. Used as a modular pair, these repairs are entirely hidden from view. These cabinets were probably produced between the end of the war and the very early 1950's. Johnson Furniture was a "premium manufacturer" in Grand Rapids, MI. These items show exceptional casemaking with beautiful dovetail construction, sophisticated design, attractive veneers, dust partitions bewtween every drawer, and a rich finish that appears to have also been extremely durable. 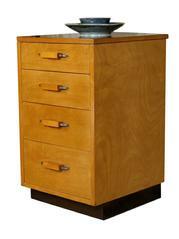 These cabinets are priced separately and can be purchased singly. However, their original Saarinen design is intended as modular. As a result, we offer the pair at SOLD.